Posted on: October 4th, 2018	by Jennifer A. 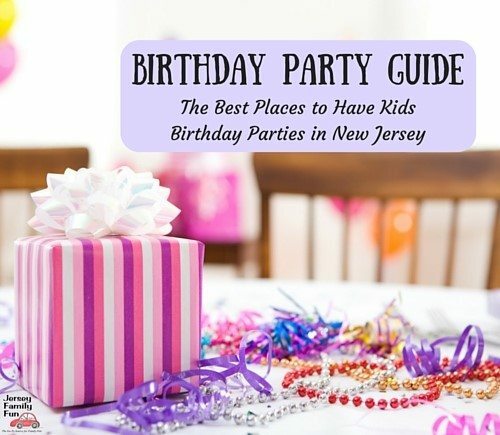 This post was sponsored by Sahl’s Father Son Farm in Galloway, New Jersey, who is a 7-year advertiser with Jersey Family Fun. 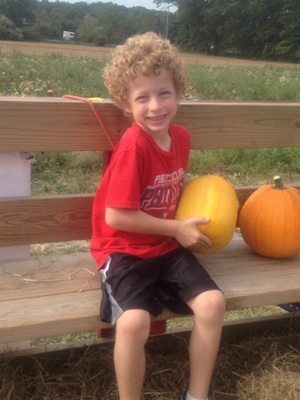 We’re thrilled to share with you information about Sahl’s Father Son Farm Fall Activities. It’s fall! Time to play in the hay again! My favorite thing about the fall has always been playing with my kids in fields of hay. There is just something about it that reminds me of my youth and makes me toss away my concerns and just truly be in the moment with my kids. 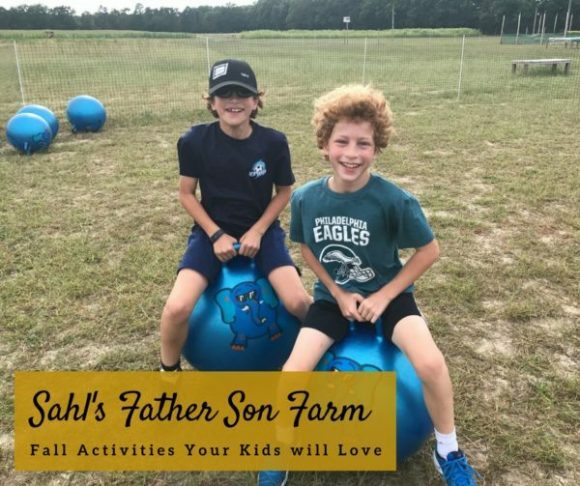 With that in mind, we are so excited to welcome the fall again with Sahl’s Father Son Farm and tell you about all the fun you must have at Sahl’s Father Son Farm this fall. Since 2013, the Auer boys and Sahl’s boys have been jumping quite literally into the hay to help us welcome and celebrate the opening of the farm each year. Life has gotten much busier for my family since 2013. But outdoor play like this is so important and a visit to the farm always rejuvenates me. So despite busy sports and school schedules, we still make the time to get out and enjoy those traditional fall activities as a family. 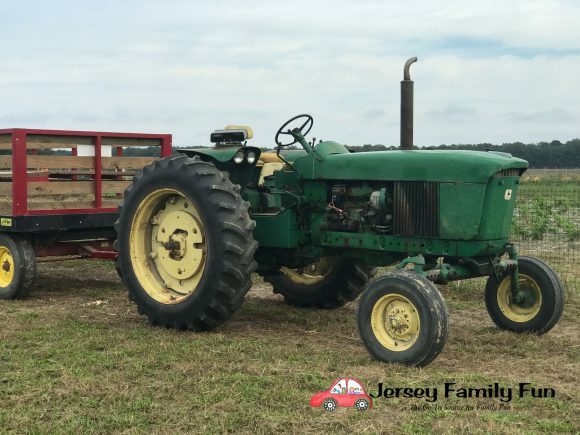 For us around Jersey Family Fun, that means it’s time to return to Sahl’s Father Son Farm for pumpkin picking, hayrides, playing in the corn, and more. 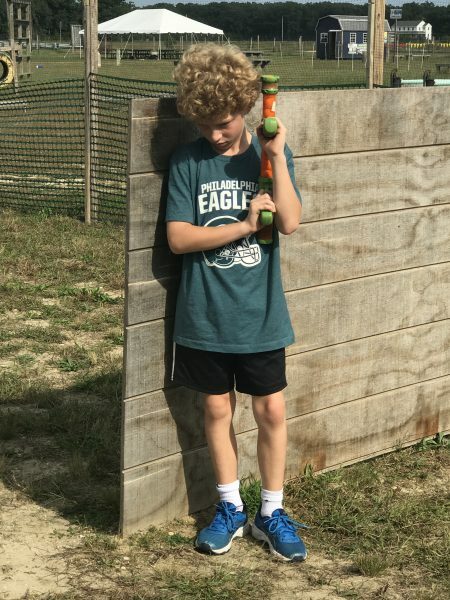 This year, we couldn’t wait to get over there to see what new Sahl’s Father Son Farm fall activities Jeremy added and of course take part in some of our favorite returning activities. Now’s the time to get out your calendar and plan for your return visit to the Father Son Farm in Galloway. 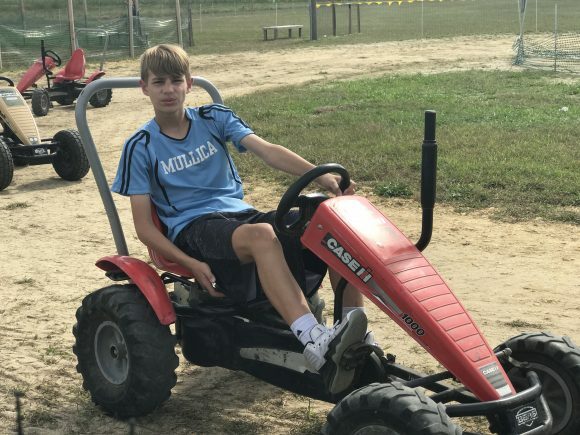 Once again, Jeremy and his family shifted the farm layout around to make room for MORE Father Son Farm fall activities kids and adults WILL love! After playing in the hay walking through the corn maze is our favorite Father Son Farm fall activity. 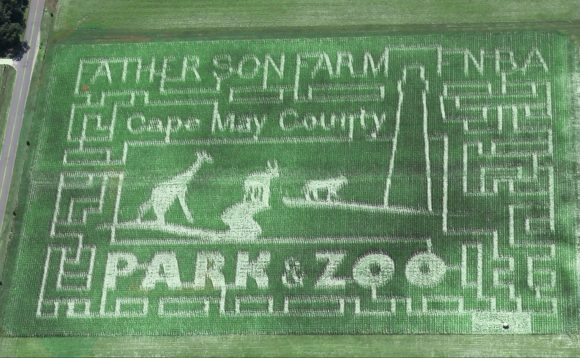 From the Philadelphia Eagles’ and Phillies’ mazes to Lucy the Elephant maze and the Cape May County Zoo, the Father Son Farm corn maze has a history of taking on a design that pays tribute to our area and South Jersey’s best attractions. This year’s design is no different and brings back a much loved theme. 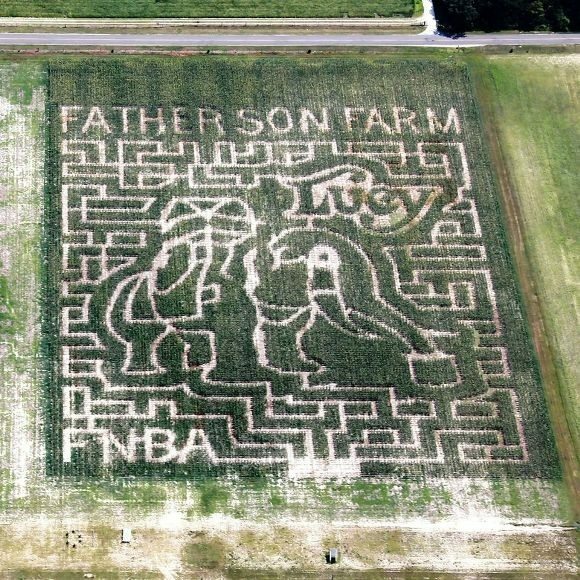 The Father Son Farm corn maze design is of the Philadelphia Eagles’ player Nick Foles to honor the Philadelphia Eagles 2018 Superbowl win. 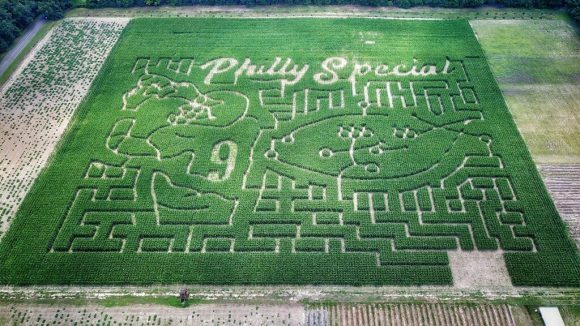 Yes, South Jersey has a Philadelphia Eagles Corn Maze. 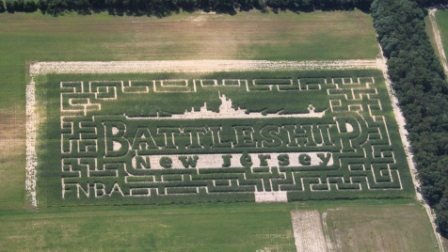 Enjoy this aerial view of the Eagles corn maze from NJ.com. 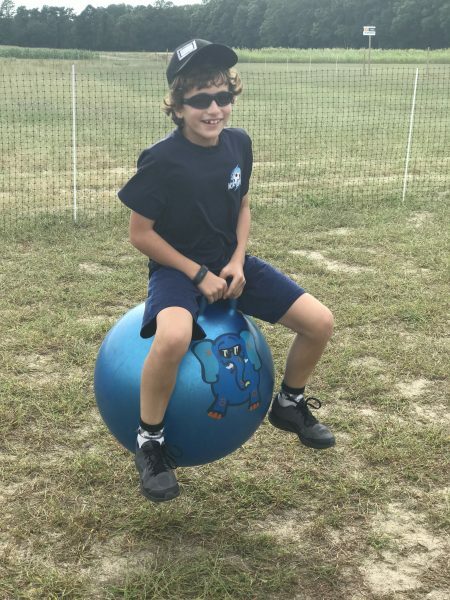 NEW Sahl’s Father Son Farm Fall Activities for 2018! There is always something new at the Father Son Farm in Galloway. 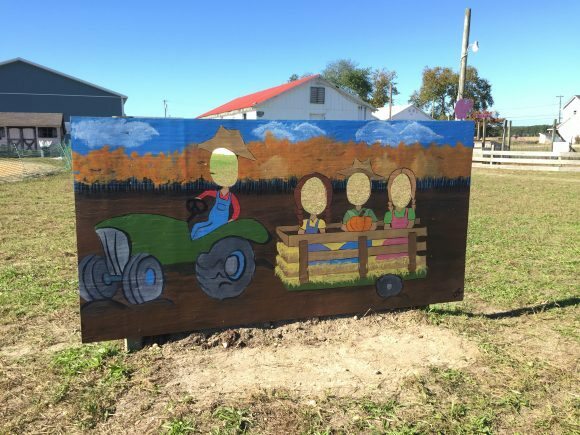 Check out the new things to do at Sahl’s Father Son Farm this fall. Which one do you think will be your favorite? 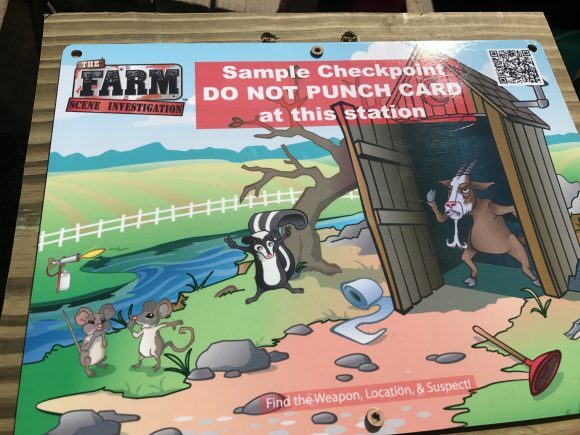 These new Father Son Farm activities are included with admission. Watch our video tour of the Sahl’s Father Son Farm. These Father Son Farm activities are included with admission. 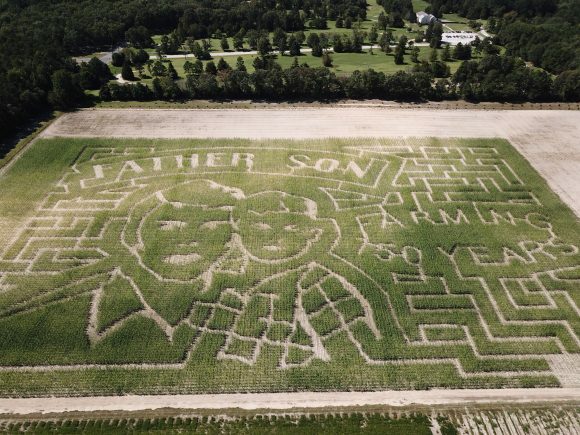 Solve a Farm Scene Investigation – As you walk around the Sahl’s Father Son Farm corn maze in Galloway keep your eyes open for clues to solve the mystery. Play Maize-O-Poly around the corn maze. 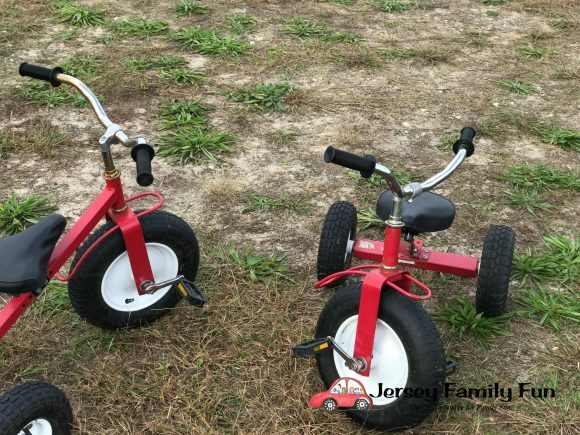 The younger ones can have a race around the Tricycle Track. 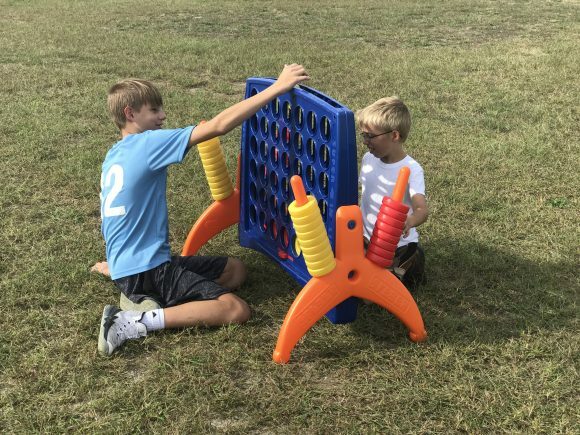 Have a game of Connect Four. Pumpkin Picking ~ Pumpkins in the patch are priced by the size of the pumpkin’s diameter from $2 to $12 each. Pig Races see our video of a pig race here. 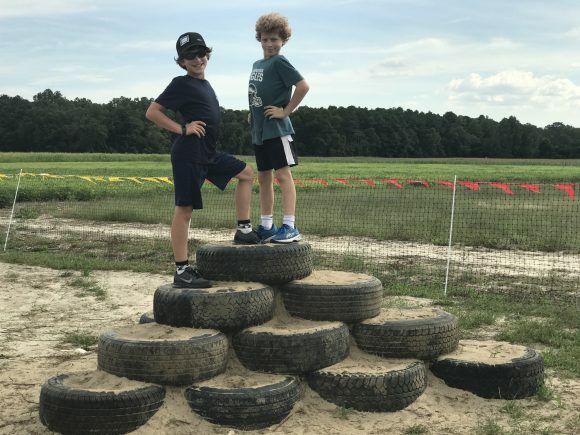 Climb to the top of the Tire Pyramid in the Kiddie Koral. These Father Son Farm activities are available at an additional charge. Three activities are available on Saturdays and require additional tickets. Pony rides will be available for $5 per ride. Tickets may be purchased at the ticket booth or directly from the pony attendants. Battle on in a game of Power Poppers ($3 per player). He’s planning a surprise attack on his brothers in the Power Poppers field. To learn about Sahl’s Father Son Farm upcoming events visit their events on our Calendar of Events. For information on Sahl’s Father Son Farm Admission Rates please visit their site. Sahl’s Father Son Farm accepts cash and credit cards. Visit and follow their Facebook page for promo codes and special discount offers. 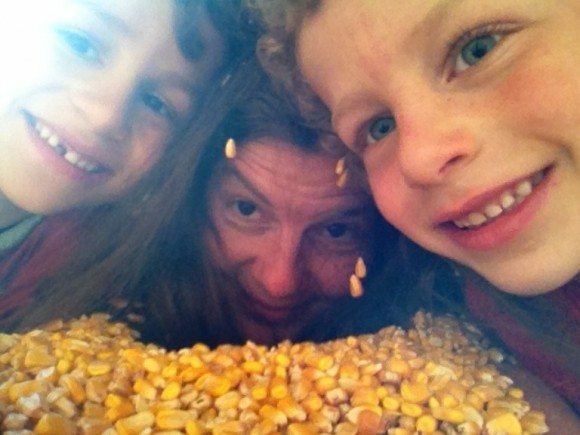 My kids had fun burying me in the corn. *Tickets will not be sold after 7 pm; however, the grounds will remain open as late as 9 pm. We will be open from 10 am – 7 pm on most “no school” days for area school districts. Sahl’s Father Son Farm is located at 420 West Pestalozzi Street in Galloway, New Jersey. 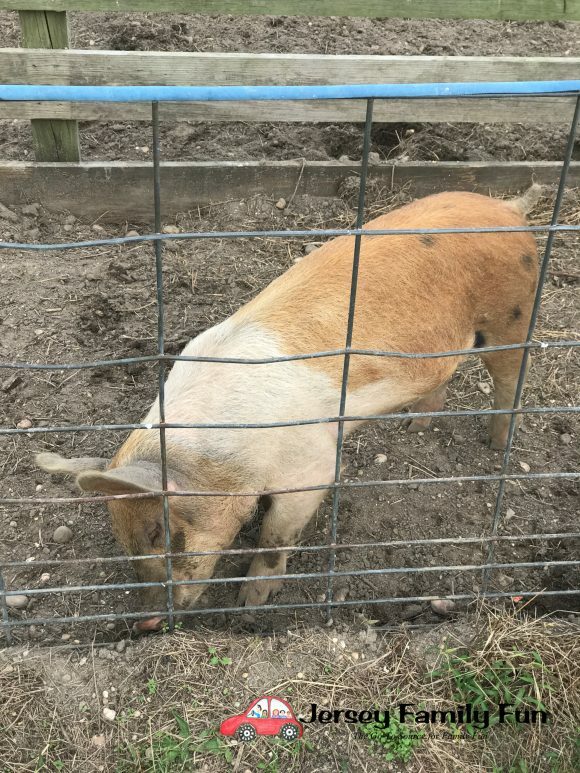 You can check out our past articles about Sahl’s Father Son Farm to see more reasons why it’s a great New Jersey Farm. Sahl’s Father Son Farm is celebrating 10 years of life-sized labyrinths in their cornfields and 150 years of farming! Farmer Jeremy and his family currently live on the original Sahl homestead which pre-dates house building records. They have no idea how old our house is. One of the Sahl family ancestors was hit by a train . . . and lived. The Sahl Family Farm was once a peach orchard. We ALL wish they still had some of those peach trees! The Sahl’s took the first step in transitioning away from horse-drawn wagons in 1912 when Joseph Sahl II was given a motorcycle by his parents. The Sahl’s were on the cutting edge of agricultural technology when they purchased their first tractor in 1927. It had steel wheels with cleats for traction. When the area first established telephone service in 1912, the Sahl’s number was 64A. It cost $15 per year to maintain service through the Egg Harbor City Telephone Company. The name “Father Son” in our title refers to Farmer Jeremy’s great grandfather and grandfather, though we would love to pass the name on to the next father/son team that comes along. Farmer Jeremy’s father remembers first driving a tractor at about eight years old. He steered the tractor while it was moving about 2 miles per hour while farm hands cut and loaded vegetables into the wagon behind the tractor. Farmer Jeremy took over the farm for his grandfather in the early 2000’s. He currently runs the farm in his father and uncle’s stead since both his father and uncle passed up the opportunity for farming to serve as ministers instead. For more information about the Sahl’s Father Son Farm, a great Galloway corn maze and farm, please visit their website or like them on Facebook. You can see more of our Sahl’s Father Son Farm photos in our Facebook gallery.